I thought, I spaced out for a little while, and it’s already the end of November. . .
Time flies too fast, please wait for me. Heat the olive oil and sauteé the shallots and garlic in a large frying-pan over a medium heat, until the shallots become translucent. 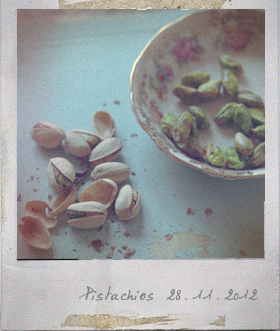 Add the grounded pistachio and sauteé for about 1 minute. Pour the cream and keep stirring for another minute, add salt to taste and remove from the heat. Add the linguine to lightly salted boiling water, cook until al dente (follow the package directions). Drain, reserve some of the cooking water. 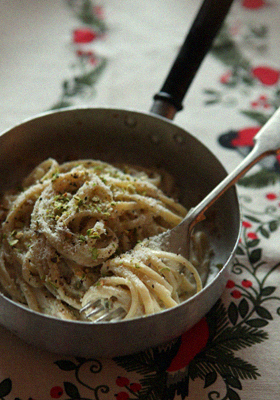 Add the linguine to the frying-pan of pistachio sauce,toss well with the sauce and add the cooking water if necessary. Sprinkle with the parmesan cheese and fleshly ground black pepper. You are currently reading Pasta with Pistachio Cream Sauce at Fish Trip Cafe.